and in our defense to stretch forth the right hand of Thy Majesty. The Station for the Third Sunday in Lent is at St. Laurence-without-the-Walls in Rome which was built by Constantine on the Tiburtine Way. It contains the tomb of the celebrated deacon, the great martyr of Rome. Enlarged and enriched in the course of the ages, it has always been much visited by the faithful. The high Altar is reserved for the sole use of the Pope; it is one of the five patriarchal basilicas of Rome and St. Lawrence asks us to remember always our need to sacrifice. The Station is in the basilica of St. Lawrence outside the walls. The name of this, the most celebrated of the martyrs of Rome, would remind the catechumens that the faith they were about to profess would require them to be ready for many sacrifices. In the primitive Church, the third Sunday in Lent was called Scrutiny Sunday, because it was on this day that they began to examine the catechumens, who were to be admitted to Baptism on Easter night. St. Lawrence the deacon was the martyr who was roasted on a griddle in 258, or perhaps beheaded with Pope St. Sixtus II, and buried in the Agro Verano along the Via Tiburtina. Perhaps because tradition preserves Lawrence?s last quip, ?Turn me over, I?m done on this side!? he is known as the patron saint of cooks! The station dates from the fourth century. San Lorenzo was declared a patriarchal basilica, one of the three Minor Basilicas of Rome, by Leo I (440-461) and assigned as the Roman residence of the Patriarch of Jerusalem. 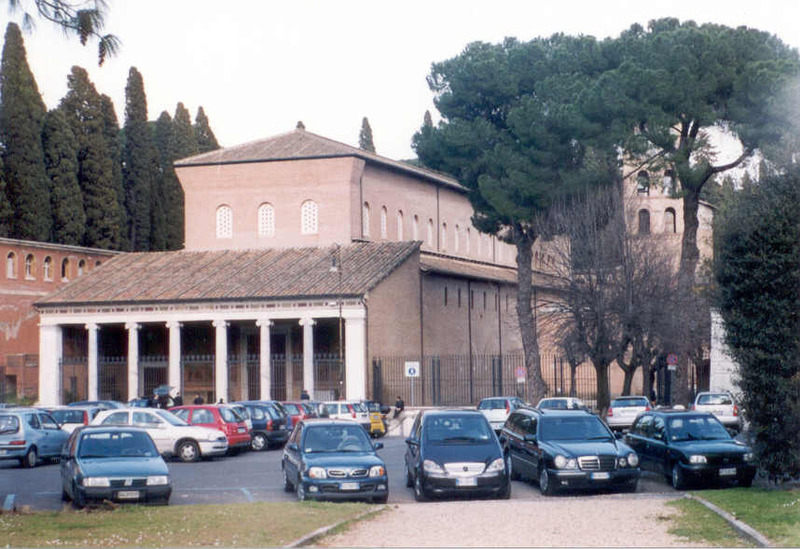 The present structure is composed of three originally-distinct buildings: 1) the western half (present nave) is the basilica of Sixtus III (432-440), 2) the eastern half (present chancel) is the basilica of Pelagius II (579-590), which originally faced east, and 3) its apse was built over the Constantinian oratory enclosing Lawrence?s tomb. Honorius III (1216-1227) demolished the two abutting apse walls and united the ends of the nave to form a single basilica with the old confessio in the middle; he also raised the level of the Pelagian basilica, so that the chancel now appears to have a full crypt (the original floor level) under the present pavement. Note the Romanesque campanile and the fine mosaic frieze of the portico (13th century). In the portico on the left you will find a 5th century sarcophagus which once contained the remains of Damasus II (1049), a reforming pope whose reign of 24 days was cut short by malaria or poison. In the nave, at the head on the left is the entrance to the catacomb of St. Cyriaca (of Santa Maria in Domnica fame), substantially destroyed in the 19th century when the cemetery of Campo Verano was enlarged. On the right is the sacristy and entrance to a 12th century cloister. In the chancel, the 6th century mosaic on the triumphal arch is worth noting, with Pelagius offering his church. Also note the 12th century main altar, the 13th century episcopal throne and mosaic screen, and a slab stained with Lawrence?s blood. The old (east) narthex has been converted into the Funerary Chapel of Blessed Pius IX, who founded the North American College in 1859 ? look for the emblem of the College and the American flag here among the three mosaics. Under the baldachin, the tomb chapel contains the relics of St. Lawrence the deacon and Stephen the deacon and protomartyr whose death is described in the Acts of the Apostles. Justin, philosopher and martyr who died in Rome around 165, is also here. Allied raids during the Second World War severely damaged Campo Verano and the basilica in their efforts to hit the railroad yards. It was the only church in Rome to be damaged during the war, and has been meticulously restored. The large bronze statue of Pius XII (1939-1958) in the Piazzale Verano commemorates the visit of the Papa Pacelli and Monsignor Giovanni Battista Montini (later Pope Paul VI) after the worst raids in August, 1943. The church is cared for by Franciscans of the Piemonte province. The College?s mausoleum is located in the nearby Campo Verano cemetery. Location: At the Piazza San Lorenzo, not far from Stazione Termini, next to the Campo Verano cemetery. whom Thou doest grant to partake of so great a mystery.